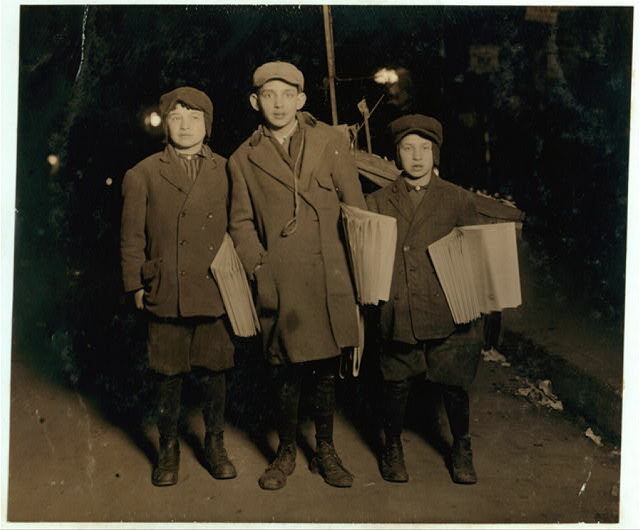 Hanukkah starts tomorrow night, but these guys are still on the street selling newspapers. According to the caption, it’s midnight on Delancey Street and (left to right) H. Brown, age 12, Scheer, age 14, and M. Brown, age 10, venture out on the street to sell newspapers, the Jewish publication The Warheit, whose offices at 153 East Broadway were nearby those of the nation’s largest Jewish paper, The Daily Forward. Photo by Lewis Wickes Hine, taken in 1913. Actually, it was in March 1913, nowhere near Hanukkah! I just wanted another reason to post another newsies photo. The Warheit, by the way, was the scene of a horrible riot just a couple years earlier, in August 1910, when “a mob of several thousand cloakmakers, strike sympathizers and excited persons” smashed office windows and injured several employees, incited by a rival newspaper.